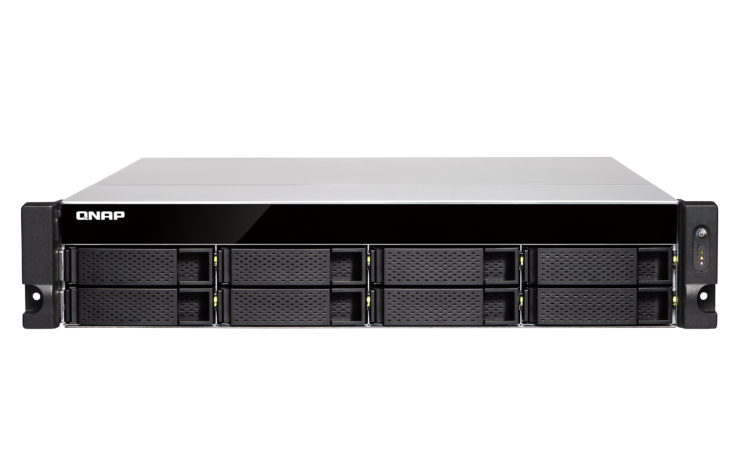 QNAP Systems, a leading storage, network, and computing solution provider, showed off their high-performance TS-x77XU rackmount NAS series. This series features a variety of sizes from the 8-bay TS-877XU-RP, the 12-bay TS-1277XU-RP, and finally the 16-bay TS-1677XU-RP. 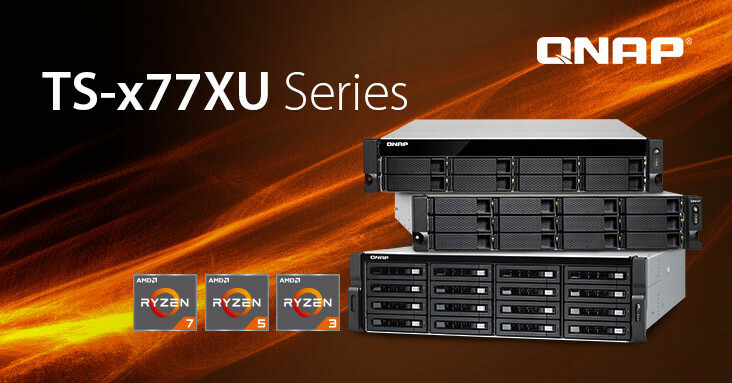 Utilizing AMD’s new energy efficient Ryzen processor family with high cores and thread counts, the TS-x77XU series has been significantly boosted to meet the most-demanding virtualization needs of enterprises. The TS-x77XU series is available with Ryzen 3 1200, Ryzen 5 2600, and Ryzen 7 2700 processors, all of which demonstrate astonishing processing power for versatile applications and scenarios (including desktop and server virtualization, on-the-fly video transcoding/streaming, and private cloud infrastructure). Four PCI Express (PCIe) slots are available in all models, allowing users to expand NAS functionality with network adapters (40GbE, 10GBASE-T/NBASE-T), USB 3.1 Gen 2 (10 Gbps) cards, M.2 SSD cards, and graphics cards. The TS-1677XU comes with a 500 W power supply unit (PSU) to support a graphics card that requires additional power. Models with redundant power supplies are also available. David Tsao – Director of Product Management of QNAP. QNAP says that the multi-threading advantages of the TS-x77XU series are especially suited for virtualization which is what’s made many flock to the mainstream Ryzen and Enthusiast Threadripper CPUs. The series is virtualization-ready for VMware, Citrix and Windows Server 2016 environments with the support of iSER (iSCSI Extension for RDMA) thanks to built-in Mellanox ConnectX-4 SmartNICs. The TS-x77XU series can also host virtual machines and containers, acting as an efficient all-in-one server, and supports snapshots and virtual machine backups for complete virtualization management. The series also supports Virtual QTS,(Which is only supported on the Ryzen 5 2600 and Ryzen 7 2700 equipped models) allowing users to run multiple virtual QTS operating systems on a single NAS, providing benefits of resource segregation (CPU, memory, networking), flexible application deployment, and providing energy, cost, and space savings. The TS-x77XU series supports RAID 50 and 60 for greater protection and random writer performance to strick a balance between performance, capacity and protection. The latest Qtier 2.0 adds IO Aware capabilities for SSD tiered storage to keep a cache-like reserved space to handle burst I/O in real time, maximizing the cost-to-performance value. It also features a redundant power supply to keep your system running 24/7 for those who need always-on systems. They say that the TS-877XU is available in a single PSU configuration for those looking to save money. Finally here are the specifications QNAP has provided us of the models. QNAP has said they are available now, but I couldn’t find anyone selling them in stock currently.